I'm working as a remote ScrumMaster since approximatively 2 years with the same team. This team is a full remote team even if most of the times we are doing our sprint planning together IRL. I went with my product owner to setup a new team in Vietnam six months ago. This new team is a bit different because, compared to "mine", all team members of the new team are working together on the same office. It was quiet challenging because it was planned to make both teams working on the same project and same code base. Now, 6 months and a product release together later, we decided to make a retrospective with the two teams. The goal was to find out what was working and what was not regarding the collaboration with the two teams. So I was responsible to setup this retrospective. 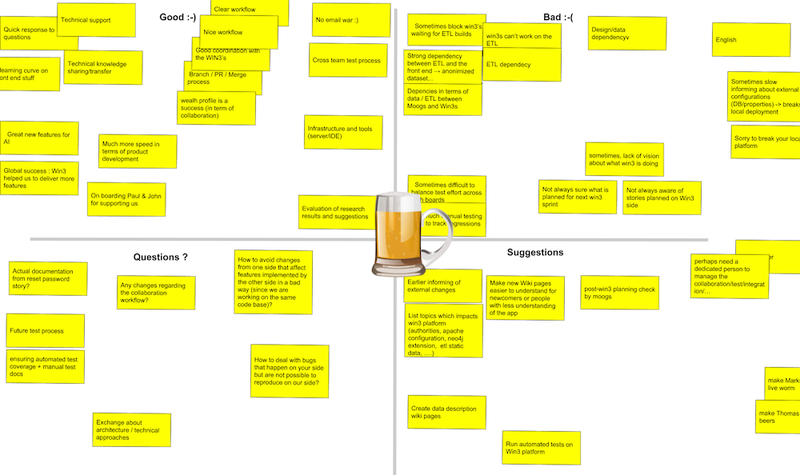 I wanted to port my usual local retrospective format based on sticky note with a whiteboard using good/bad/questions/suggestions areas. - a good communication tool. - a good virtual white board. We were used to use Google Hangout so we sticked with it as our communication channel. The only problem is the 10 slots limitation that i will have to deal with. Due to the quality of the internet connection of the green team and to the google hangout limitation, we decided to use the green team scrumMaster as a proxy of the other teams member and to use only one google hangout slot for the green team. fix the date, not so easy to find a slot which everybody. had setup of the google drawing white board, made some try. talked to the product owner to explain how it will work. talked to the other scrumMaster to explain how it will work. sent an email to all participants to remind the goal and scope of the retrospective and to ask them to start to think about that. talked again with the other ScrumMaster. As he acted as team's proxy, we discussed together to try to prepare that as better as we can. verified that everybody was able to join the shared google drawing. The scrumMaster of the green team was the proxy of the whole teams. It was ok because he was already used to do that for others meeting we already had. Anyway It would have been better to have the whole green team at the same "level"
It worked well! 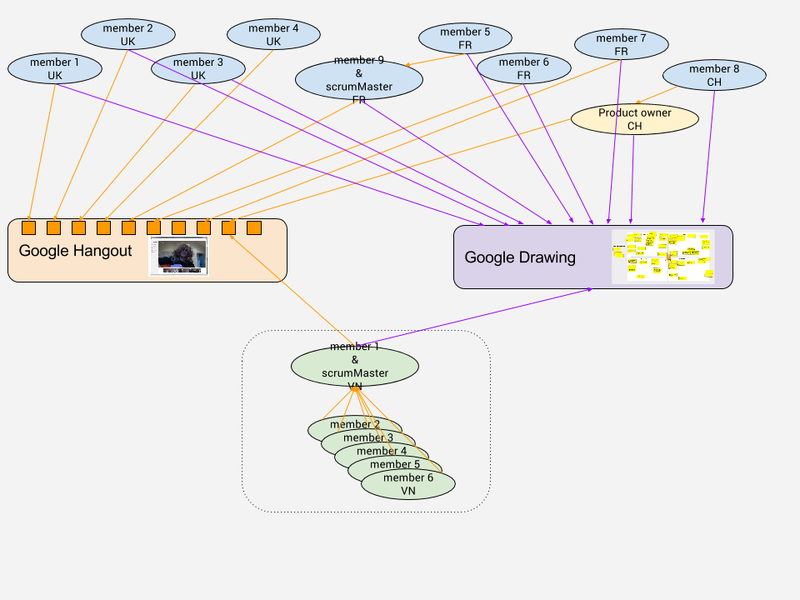 Using Google drawing as a virtual shared white board was really successful : simple and efficient. It's now decided to do that one time per release. the virtual retrospective was no longer than the local retrospective i was used to do locally. There was more preparation from me compared to a local retrospective. I had to allocate more time than initially planned to allow everybody to fill the google drawing.